The Multi Activity Package (MAP) is a 5-day course. There 30 vacancies on each MAP Bavaria course. 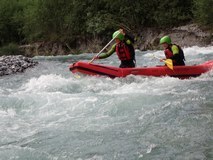 The course will be split into 5 groups that will rotate around each one of the Adventurous Training activities: mountaineering, rock climbing, canyoneering, inflatable 2-person canoe white water and klettersteig. The outcome of the course is to deliver a fun and challenging programme providing an introduction to a mixture of Adventurous Training activities.